Hold your own spelling Bee! Let’s face it. At times, spelling can be challenging for us all. The language portion of the ITBS requires students to identify the misspelling of certain words. In order to identify these often subtle errors, the child must already be fairly comfortable with the correct spelling of the word. It’s always fun to get a little competitive with yourself, and spelling bees can do just that! Conducting a weekly at home spelling bee will keep your child on track with his or her language skills. Start by compiling a list of words that are appropriate for your child’s spelling ability and grade level. If you need a bit of extra assistance with forming a list of words, Testingmom has you covered. If you visit the practice question tab for the ITBS, (under the subtest language) you can find a list of vocabulary words that are either spelled correctly, or misspelled. Use these words as a reference for your personal list. Start by putting the word on a flashcard along with the definition on the back. This way your child can test themselves on the words before the big spelling bee. If you need additional vocabulary words, a helpful site is www.bigiqkids.com. This site offers pre-made lists of words that are customized to your child’s grade level. During the course of the spelling session, try and keep track of the words that your child needs additional practice on! This way you can include them once more on the new list for the following week. If you can, try and arrange your Spelling bee for the end of each week. This way your child has enough time to practice each new list of words. This is a great activity for you and your child to do together. 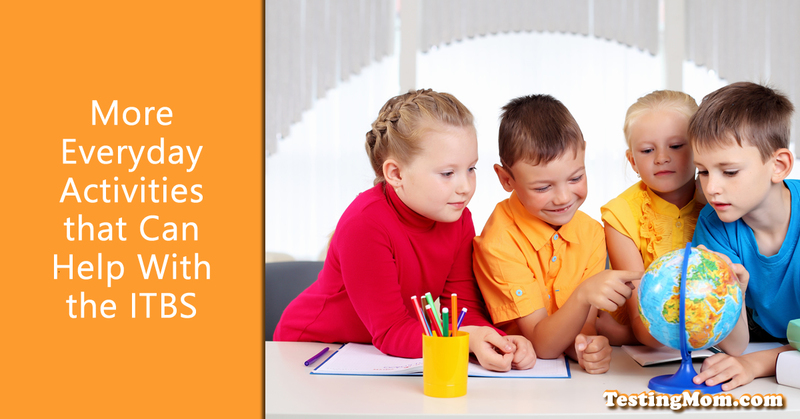 Spelling takes practice, so try and encourage your child to stick with the process! Happy spelling! Let’s watch a documentary! Documentaries can be a highly effective way of transmitting historical information, current events, vocabulary, and plot development to students in an accessible manner! More specifically, documentaries can assist students with the social studies and reading comprehension subtests. The rich and vivid visuals will help to keep the children engaged in the storyline, and will be sure to keep them asking questions! Some environmentally focused documentaries that will intrigue your child are “Arctic Tale” and “March of the Penguins”. Collectively, these documentaries inform one of the realities of global warming, migration, survival, and the importance of taking care of your environment. Another great documentary is “In The Shadow of The Moon”. This film focuses on the NASA moon mission. This is an especially good documentary when it comes to learning about history and science. Of course, these are just a few of the many documentaries that exist! When the documentary is over, test your child’s comprehension and analysis of what they just watched. You could discuss the various plot points, character development, overarching themes, and even their opinion of the conclusion. Big picture idea are also important. Always ask them what their “take away” was. The key is to be engaged with your child. Talk about everything! Ask question to gauge your child’s understanding. More importantly, have fun with these activities! Ask you can see there is a lot to talk about when it comes to ITBS practice through everyday activities. These are only a few of the many activities that you can delve into for practice. I’ll be back next week with a few more activities you can do to prepare for the verbal portion of the ITBS. What is the ITBS Test? How is the ITBS Test Scored?